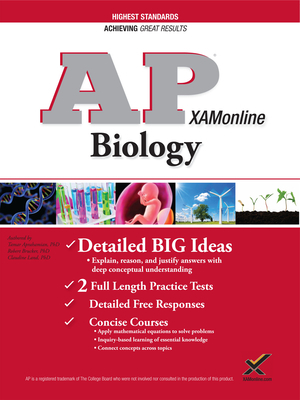 Prepare for the AP Biology Exam with the updated study guide from XAMonline This comprehensive study guide has been formatted to correspond to the four Big Ideas described by the College Board: evolution, energy, information, and systems. Expert knowledge and real world scientific experience allowed the authors to not only include the necessary review of the basic content, but also the intertwined fundamental ideas underlying biology. The full-length practice tests have been designed to focus on complex questions that require critical thinking and problem solving - similar to those on the actual AP Biology exam. Highlights include: - 2 full-length practice tests and answer keys - End-of-chapter practice quizzes and answer keys - Explanations for answers to all multiple choice and free-response questions - End-of-chapter summary and list of keywords for important concepts - Illustrations throughout to give additional support to the learning experience.